Is your current phone system still the right choice for your business? Focus research indicates that VoIP (Voice over Internet Protocol) has become an attractive alternative to older telephone technologies for SMBs. This information-packed guide compares the top 10 hosted VoIP phone system solutions for SMBs. Reviewing the key features and data points will help you to decide which solution is best suited to your business. 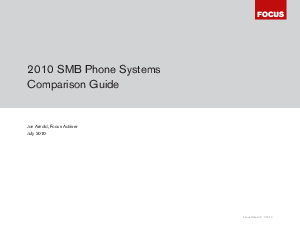 Download our free SMB Phone Systems Comparison Guide now!